Reviewing the three baseball books that have occupied my mind the last couple months. I never really thought about this until now, but it's incredible to realize that every year (for 8 years and counting) I devour the entirety of a book that is literally the size of a phonebook. 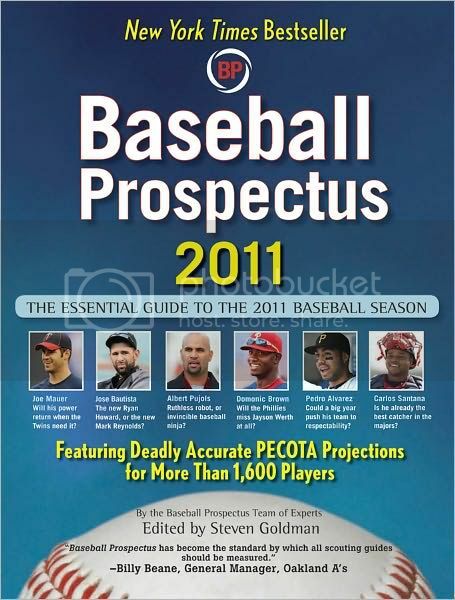 Usually, I will gradually cruise through the Baseball Prospectus annual throughout the summer until I've finished it. This year, I surprised myself by zipping through the whole thing in less than two months. The arrival of the new BPro publication is a yearly ritual for me as I'm sure it is for many other devout baseball fans. In the foreword to this year's edition, Joe Posnanski gives a rundown of the exact manner in which he approaches the great tome every year. For me, I spend a few days just flipping through it, reading bits and pieces and soaking up the feeling that a new baseball season is upon us. Then I start reading through the essays of each team (starting with the crappy ones, saving the best teams for last) along with the capsules for their key players. One of the many beautiful things about this book is that after reading the whole thing, it then becomes an essential reference book; a perfect, handy (though heavy) guide to flip through whenever watching a ballgame. Now, as an annual devourer of these books, I find myself scrutinizing the mistakes and typos (there are plenty, as usual) and holding it up to a very high standard. I expect a lot from this book and it's something I look forward to reading every year, not just because of the sharp and thorough baseball analysis, but because the quality of the writing is usually excellent. The Prospectus think-tank has seen a lot of turnaround among its ranks these last few years, though, and the quality does occasionally reflect that. Some of the writing is very bland and doesn't offer anything new or special in the way of baseball analysis---I was particularly unimpressed with the team essays for the White Sox, Rangers, Giants, and especially the Mets. It also becomes very obvious when you read through the player essays that the writer isn't looking at the same stats that the reader is being shown. In that respect, they actually got a bit sloppy this year. It seems like the best chapters were those for the lesser teams. I loved the Orioles team essay which put into perspective the nearly unprecedented turnaround the team had last year; the Nationals got one of the best essays in the book, one which compares them to Dave Dombrowski's successful Tigers teams and even speaks of a growing Nats bandwagon; the Astros, perhaps the shittiest and most boring franchise in baseball right now, received an insightful and humorous assessment, same with the Indians. As for the good teams, they certainly present a great case for why the Reds will be a competitive force for the upcoming future (a great defensive team with tons of young talent) and pick apart the always interesting Colorado Rockies. On my eighth or ninth edition of this book, it's pretty clear they have developed a formula for the writing style which always features lots of snark and cultural references to bring much needed levity to a scientific, numbers-heavy content. They can tend to pile it on a bit thick, though, and the same jokes (this year it's obesity humor) repeated over and over fall badly flat. Despite its flaws, this vast text is still a delicious treat that doesn't lose its flavor even months after you've completed it. A worthy addition to the annals of Prospectus annuals. 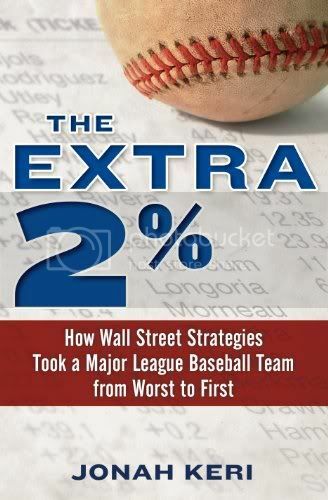 This book felt very much like an unofficial sequel to Moneyball or, perhaps, a nephew to Michael Lewis' famous book. The author certainly doesn't hide that, often referencing the book that told the story of the shrewd Oakland A's front office. Just like Moneyball, this book has a great story. The worst-to-first scenario played out so ideally for the Rays that, honestly, it's a meatball pitch for any astute baseball writer to hit out the park and Jonah Keri does just that. He's certainly got a gift for storytelling and juggling different scenes in a narrative, often jumping nimbly between decades or individual seasons while following a general chronology of the Tampa Bay Rays' history. After its inception in the late 90s, the organization was so unbelievably pathetic in every possible way that it's often comical. The team president was a world-class schmuck who wouldn't even let the employees use e-mail, considering it to be just a fad. His business manners pissed off everyone: the employees, the fan base, local businesses, even the city itself. Three Wall Street honchos eventually took over the reins and completely changed everything about the organization, from the team name (exorcising the "Devil" out of "Devil Rays") on down to the allowance of outside food to be brought into the ballpark and free parking. They needed to revamp the team's image and they not only accomplished that, but they built a powerhouse that managed to win the AL East two out of three years with a minuscule payroll. I particularly enjoyed the chapter on the team's manager, Joe Maddon, covering his background and ascent to the role of major league manager. Maddon is a highly interesting character; a baseball lifer with broad intellectual interests who frequently goes against the grain and the accepted baseball wisdom in his machinations. The chapter entitled "Mystery Men" was also great, describing the Rays' manner of seeking out bright sabermetricians to build a powerful braintrust of brilliant baseball minds on the cheap. The whole Rays story is a great one, enough to make me a fan of theirs, but what makes this book special is that it's written in an extremely readable, smooth manner. At the inception of my deep intellectual interest in baseball, one of my must-read websites was the upstart Hardball Times. The staff has changed a lot over the years as many of their original writers have gone on to bigger gigs, but they still produce plenty of great (and free), cutting edge baseball content. I was one of the few people that bought their first venture into book publishing and I've been getting their Annuals every year since. The timing of the book's release is a bit awkward, though. First, they were releasing the book at the conclusion of each season to examine what had happened that year. And now this last iteration was released so soon after the season that its content doesn't cover the playoffs or World Series. Repeating the same exact cover art for a few years in a row doesn't look great either. Nevertheless, this an awesome book. It is split into halves: a collection of essays and studies on various aspects of the game in front and full thorough stats for every team in the back. This year had a bunch of excellent essays including a really long one (15 pages) by legendary analyst Craig Wright on the proper way to get the most of a pitcher. That's really the must-read essay in the book that's worth the purchase price on its own. But I also loved Steve Treder's piece on the reasons for last year's low scoring levels (an interesting relationship between pitcher, batter, and umpire is apparently behind it); Jeremy Greenhouse used the data goldmine of Pitch f/x to identify the pitchers in the game with the best "stuff" (hardest throwers/best movement) and location yielding fascinating results in a well-written piece; Sean Smith examined the oft-asked question of whether or not catchers have a real impact on the performance of their pitcher and the results were groundbreaking (backstops do have a noticeable effect). There's also an intricate though highly readable breakdown of Barry Zito's fall from grace and return to respectability as well as an eye-opening little piece by Tom Tango that might make you see the game a bit differently (with regards to balls in play, at least). The cover boasts "timeless commentary" and, in fact, I do find myself digging out last year's edition of the same book to read some of the essays because, for the most part, they don't lose their luster. And this current edition is already about 6 months old but I've been reading it constantly. 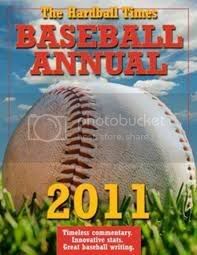 Great, informative, worthwhile reading for a baseball nut.